I will be honest, I am not an “animal person,” some people love to see animals in their natural habitat and learn all kinds of amazing facts about them but NOT ME. Want to tell me the gestation period of a rhino, you will get a glazed look from me. I preface this horrible fact about myself because it will give you an idea of how wonderful this tour is because I actually loved it. 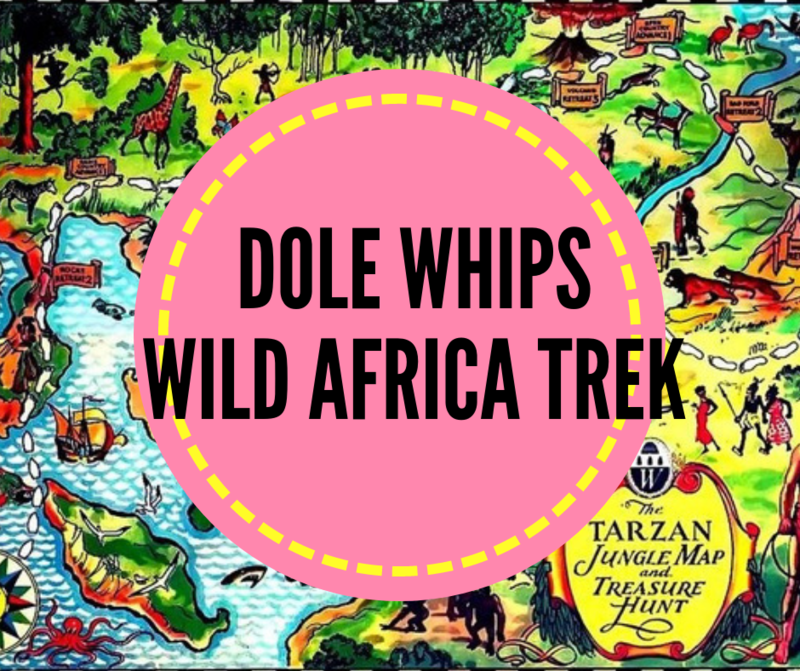 I arrived on Africa Trek day at the Animal Kingdom, and it was hot, August hot but I was ready for the challenge. We were greeted by a super friendly team who quickly got us through check-in and waiver signings. We moved to an area where were fitted with our Trek Gear. This included a vest, harness, receivers, headphones, water bottle and names tags. You are not allowed to bring anything with you besides sunglasses and your cell phone, and they will attach neck straps and wrist straps for you. Your cell phone is connected to your vest via this strap. All your other belongings will go into a locker. Everything put together was a little bit of weight, but you quickly get used to it. Your guides will walk you through some safety tips and how to use the radios. Note that there is a plethora of hand sanitizer, sunblock and bug repellent available for your use in this prep area. Once we were all ready and prepped, we started our adventure! We walked through the primates area which was interesting but still not part of the exclusive backstage area. The fun really begins when you are taken to a non-distinct gate that will lead you to the JUNGLE! After climbing some steps, our harnesses were clipped to an overhead cable so we could get up close and personal with some hippos! This overhead harness set up is how you are able to access some of these exclusive areas without danger of falling in! We learned some interesting facts about the animals and had to scurry out quickly since our hippo friend was very given to “dung showers” which is a nice way to say “he flings his poop.” We were in no danger of getting showered, but the smell was……you get it! After a bit of light hiking, we made it to the famous ‘rope bridge”, which is dangling over hippos and crocodiles. While the bridge looks rickety and dangerous, it’s totally for effect. The bridge is steel, and you are safely harnessed in. It is however pretty high, but the views are breathtaking. It’s also fun to wave at the folks on the safari driving by who are definitely wondering if you have lost your mind! The best part of this bridge crossing is that you can take your time and only two people are allowed to cross at a time. You won’t feel rushed, and you can take it all in. It also minimizes the bridge moving which definitely gives you the butterflies! I will point out that they place the “planks” on this bridge far apart in some areas. I am barely 5’, so there were moments that I actually had to hop from plank to plank. That was fun times on the swinging rope bridge. Once you make it across both bridges, you are given a water break while you wait for the rest of your party to cross the bridge. After everyone is done, you are led to the crocodile area (because hanging over them was not enough) clipped in and given time to get a bit closer to these amazing creatures. Every bit of it was tasty, and I really enjoyed the Chicken Curry Salad. We also had a choice of POG Juice and Water. After taking some incredible photos and of course a potty break, we headed back in the truck to get the last bit of sightseeing in. The tour guides are also fantastic photographers and they are snapping candids and photos of your nail biting bridge crossing. You are given a code to access these photos online and they are yours to download. The images we ended up with were gorgeous! Again, I think it’s important to note that wildlife is not my thing and I left this tour amazed and with a brand new appreciation of precisely what Animal Kingdom is doing. I am so lucky that I was able to get out of my comfortable, tried and true Disney Bubble and try something I never would have considered. In an environment where pixie dust and fantasy are usually front and center, this was still just as unforgettable. I felt as if I had gone on an adventure and made memories that will last a lifetime! I cannot imagine how even more special the Africa Trek would be to someone who holds wildlife and conservation as something near and dear to their hearts. This is an incredible experience that I cannot wait to share with my whole family. This tour is an incredible chance to escape the hustle and bustle of the parks and do something genuinely unique. To add to the connection you feel with this project, a portion of your ticket price is donated to conservation efforts. At the end of the tour you are given a stone, and you get to place it in a box indicating which animal you choose for your donation. You get to choose from the Lion, Elephant, Rhino, or Giraffe, or general conservation efforts. There is a bit of physical activity on this tour. This is a great option for those tween/teens. Closed shoes and comfortable clothing are a must. Expectant mothers and those with mobility issues will be given an alternative excursion. This sounds truly magical, amazing, wonderful ..you get the point. I can’t wait to try it myself one day!